Governor Fayose recalls six out of the 16 sacked commissioners – Royal Times of Nigeria. Ekiti State Governor, Ayodele Fayose, just a week after dissolving the State Executive Council in a major decision has recalled six out of the 16 sacked commissioners . 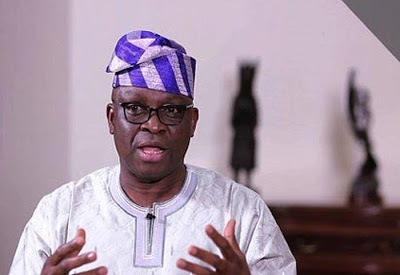 In a statement through his Special Assistant on Public Communications and New Media, Lere Olayinka, Fayose on Sunday directed the recall commissioners to return to their duty post on Monday (today). Those recalled are Commissioner for Environment, Bisi Kolawole; Mrs. Funmi Ogun (works), Ayodele Michael (Commerce and Industry), Kehinde Odebunmi (Agriculture), Toyin Ojo (Finance) and Dr. Olurotimi Ojo (Health). The governor promised to raise a good team that will give the people the deserved dividends of democracy.